We’re in the rarefied altitude of the breakout anime hit again. We’re talking Full Metal Alchemist, Attack on Titan degrees of cultural impact, shows that go beyond the province of the usual anime fan, and grab the attention of the average fan in the street, gets people talking about it around the watercooler. My Hero Academia is the latest smash to enervate the Zeitgeist. That’s because it’s a show about the genre that appeals most to comic book fans in the West, the superhero. Anime is once more setting foot on that hallowed soil that is usually the province of Marvel and D.C. Comics. This is one more chance to show the West that anime can do superheroes as good as, if not better than the West. And it wouldn’t be anime without some sort of controversy to irk the fans. My Hero Academia is big, so big that its third season is starting to stream as I write. 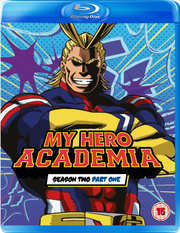 My first piece of the My Hero Academia pie to review comes in the form of Season 2 Part 1. You might be wondering what happened to Season 1. Funimation had the equivalent of a one night stand with Universal when it came to UK anime distribution, and one of the three titles that Universal released for them here was My Hero Academia Season 1. But they released it in Collector’s Edition form only, at an R.R.P. of £76.99. I’ll say that again, £76.99 for just 13 episodes of anime, plus assorted extras. There is no UK standard edition for season 1. Now that Funimation are with Sony, it is they who will release Season 2, and other than an aborted appearance of a Collector’s Edition listing in Zavvi (the way Attack on Titan 2 had a Zavvi exclusive), Sony will only release Season 2 as standard Blu-ray and standard DVD editions. There are some OCD anime fans nervous twitching right now because of this. By the way, if you think I’m going to spend upwards of £50 on thirteen episodes of anime just to get caught up with the story, think again. I’m taking advantage of the bonus recap episode on disc 1. And there’s always Crunchyroll if I need more detail. But Izuku’s selfless actions in a crisis situation caught the attention of All Might, who decided that the young boy would inherit his power. Getting used to a sudden new Quirk doesn’t happen overnight, and even with intensive training, Izuku is still playing catch-up when he enters U.A. High School, where the world’s heroes are trained. But he and his class 1-A manage to distinguish themselves when the League of Villains attacks. As this second season begins, the U.A. Sports Festival is about to begin, and All Might’s mission for Izuku is to distinguish himself in front of the world audience. 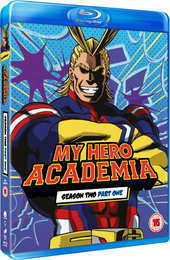 The first 12 episodes of My Hero Academia Season 2 are presented on 2 Blu-ray discs from Sony/Funimation. My Hero Academia gets a 1.78:1 widescreen 1080p transfer on these Blu-ray discs. The image is clear and sharp, the animation is smooth, and there’s no problem with visible compression, and there is only the slightest occasional hint of digital banding. Studio Bones do the honours for the animation, and they have pedigree bringing across Weekly Shonen Jump properties to anime such as Full Metal Alchemist and Soul Eater. It all begs the question as to what happened with My Hero Academia, or whether the quality of the source material is such that there was nothing that Bones could do with it. This is a simplistic animation, with generic character designs, and a basic looking world design. It looks like the kind of show that runs for years and years on a weekly basis as lowest bidder animators churn out their work conveyer belt style. That’s the look of the show, not the actual animation, as Bones takes this basic looking story and animate as much as they can, creating something that is dynamic, vibrant, and of decent quality. But you can’t get away from how basic the show looks. It looks like kids’ TV, which is probably exactly what it is. And then they do the amazing fight animation in Shoto Todoroki: Origin and it’s like you’re watching a completely different show! You have the choice between Dolby TrueHD 5.1 Surround English and 2.0 Stereo Japanese with optional translated subtitles and signs. I checked that the English dub exists (it does), but stuck with the Japanese for the duration, and was happy with the experience, with the characters suitably cast, and giving the full intensity required for their performances. The action is well represented in the stereo, and the music suits the show well. The subtitles are accurately timed and are free of typos. The sole extra on disc 1 is the very useful episode 13.5 – Hero Notebook which runs to 24:01. It’s an episode that recaps the first season, and it’s indispensable for a reviewer pushed for time and who doesn’t have the first season to hand. Disc 2 has the rest of the extras, beginning with the Inside the Episodes featurettes, which offers interviews with the dub staff and voice actors about specific episodes. There are also featurettes about some charities that Funimation supported, tying in with the My Hero Academia simuldubs. There are 11 in total here, running to a complete run time of 68:33. There is an interview with the show’s character designer, Yoshihiko Umakoshi, recorded at Anime Expo 2017, which lasts 7:47. There are 2:59 of Promo Videos for the show. You get 1 textless opening, and 3 textless endings. In recent years there has been a shift in anime production towards remaining faithful to the manga that is being adapted. You see it in shows like Black Butler, Blue Exorcist, and Tokyo Ghoul, that creators are willing to wait the months and years for new manga storyline to be completed before creating an anime adaptation, and fans are happy to wait the months and years for new content if it means avoiding poor quality filler. By and large this is a positive move, but it does preclude the possibility of someone creating a superior anime original storyline, as happened in the original Full Metal Alchemist series. But that does seem to be the direction of travel, even for the long running shonen action show staple. Having seen Naruto and Bleach filler, that can only be a good thing. I say this, as My Hero Academia is adapted from a Weekly Shonen Jump manga, and in its structure, storytelling style, art style and characters, it is very much one of those long running action titles. The big difference is that they are animating it in series, with lengthy gaps in between, no doubt to stay faithful to the manga, to avoid animator burnout, and to keep the quality as high as possible. All long running shonen manga tend to have tournament arcs that pit their characters against each other, and Season 2 Part 1 of My Hero Academia is it, this story’s equivalent of the Chunin Exams from Naruto. I say all this so that you are certain of what you are getting. It’s the difference between popularity and quality. My Hero Academia is big, it’s one of the biggest titles out there right now, another chance at a breakout anime. But if we’re talking anime superhero shows, it’s mid-tier at best. You’ll want to watch Tiger & Bunny, One Punch Man, even Karas and Witchblade before you try this. My Hero Academia takes the superhero genre and twists it so it fits the basic, long running shonen action stereotype, and it does fit, but it is slow, convoluted, and fixated on the details, as these shows usually are. The recap episode on disc 1 does help getting caught up with the story, but not so much when it comes to character development, especially as is the case in such a show, there are so many of them. Izuku Midoriya is the hero of the show, an unlikely one at that, a boy born without a Quirk, but who inherits one from the strongest hero of them all, All Might. All Might is quintessential muscle in action, but literally deflates otherwise; he’s overused his powers to the extent where he’s become limited (a bit like Kotetsu in Tiger & Bunny) in how long he can use them. That’s the reason why he chose Izuku to inherit his power. Izuku’s at a disadvantage in that he still really doesn’t know how to use the ability without injuring himself, and he tends to succeed through superior willpower as all such shonen anime heroes do. His childhood friend/rival is Katsuki Bakugo, who can unleash explosions at will, and he’s a wannabe hero with a serious inferiority complex, magnified now that former wimp and bullying target Izuku has a Quirk, and the temerity to beat him. Katsuki is loud and obnoxious. Think Black Star from Soul Eater but without the charm. Ochaco Uraraka is the spitting image of Mako Mankanshoku from Kill La Kill, but sadly lacks the personality, although she has a cool gravity controlling superpower. She’s the strong and stable support in shows like this. Tenya Iida runs really fast, is straightforward and upright, and has Sky High’s personality from Tiger & Bunny. Shoto Todoroki has inherited ice powers from his mother, fire abilities from his father, and has a sullen personality because of his stressed home life, refusing to use his fire powers to spite his father. There are plenty of other trainee heroes as well, frog girl, crow boy, elbow tape boy, hard skin kid, steel skin kid and that’s just in class 1-A which was introduced in season 1. With the second season beginning with the tournament arc, we get to meet other students from the school as well. It could so easily be overload, but the way the story unfolds handles the volume of characters well, giving them all a moment to shine, and developing the stories for the main characters as well. The twelve episodes in this collection comprise the show’s tournament arc. It’s complete in this collection, and given shonen anime’s tendency to use “vs.” in spoilerific episode titles, you’ll already know who the finalists will be before you even watch a single episode. But it does offer a variety of fun mini-arcs, beginning with a zany obstacle course, before a cavalry battle (the sort of competition where teams of three or four pyramid up, and chase each other around the field trying to steal headbands). Finally we get to the staple of the genre, the one on one tournament combat battles, where the budding heroes get to try out their powers on each other. What makes My Hero Academia so enjoyable is that it manages all this in a short, sweet, twelve episodes, where something like Naruto would have taken thirty or forty. You’re always entertained by My Hero Academia and never bored. While all this is going on, story unfolds in the background, with ominous figures among the audience watching the tournament, and the advent of a new villain, Stain Hero Killer towards the end of the collection who makes a personal impact on one of the characters in the show. This would probably have meant more to me if I had seen season 1, but I certainly had more than enough with the actual tournament to keep me entertained. My Hero Academia is a lot of fun, one of the better shonen action shows around, up there with Fairy Tail and Naruto, and given the distillation of its story, no extraneous filler, it’s even more satisfying to watch, despite the traditional flashbacks and recaps during the episodes. But it is just another shonen action show. It boggles my mind that Funimation are releasing it in Collector’s Edition format (at least in the US). Can you imagine paying $85 RRP for a show like Naruto in 12 or 13 episode chunks, just for big boxes full of added fripperies? Just how much shelf space do you have? My Hero Academia has the scope to run as long as Naruto or even One Piece if it gets the traction. I can understand why Sony dropped the Collector’s Edition format here, and what they or Universal really need to do is re-release season 1 in a standard version.